However, treating back pain with your swimming pool is much more manageable when you practice some aquatic therapy. When you suffer from chronic back pain, you will be willing to try almost anything to get rid of it. You might not expect relief to come from a vigorous swim in your backyard pool, because you think that will only make the problem worse. However, treating back pain with your swimming pool is much more manageable when you practice some aquatic therapy. Let’s take a closer look at how to do this. How Prevalent is Back Pain? First, we’ll need to consider some relevant statistics. The CDC has indicated that pain affecting the spine or lower back is one of the most common disabilities. As it happens, back pain is the second most prevalent disability in the country. Sixteen percent of the US population has to deal with it, and more than 80% of sufferers have had a severe incident relating to it. It’s much more common in older patients, and also much more common in men, despite common misconceptions that point to women suffering from it more often. Treatment is often complicated and confusing. CT scans, MRI scans, and X-rays are all ways your doctor can attempt to identify the source of the problem. Blood tests and EMG tests are two other methods that your doctor can use. Even so, massages, physical therapy, chiropractic treatments, pain relief medications, and nerve stimulation can all help alleviate the pain. Aquatic exercise such as spending time doing laps in your swimming pool can also make a difference. Along with less pain and pressure on your back, you will also find that your back muscles will get stronger. Plus, the ligaments in your spine will be more developed as well. A stronger back should help you experience less debilitating pain. Swimming can help your back pain get better. 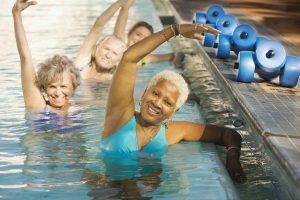 Even though the effects would most likely be the same if you exercised in a community pool, using your own swimming pool would be much more comfortable. After all, you wouldn’t have to share the water with strangers if you don’t want to do that. Water gives the swimmer a sense of weightlessness and release from gravity. There has to be a reason that astronauts train for their missions by practicing spacewalks in giant underwater tanks! Aquatic therapy also helps your back because you won’t have to put up with your body weight holding you down the same way it does when you exercise in a gym. You can jog in the water, do some yoga, and even use pool noodles to help give you some resistance training. Video tutorials on the Internet can show you what to do and how to get started, especially if you don’t know how to use floatation belts or kickboards. This entry was posted on Friday, March 29th, 2019 at 1:59 pm. Both comments and pings are currently closed.